At first glance, everything is wrong with this picture: The sky is dark gray with wind-blown snow, I am standing in the middle of a lake on ice that was slushy at best the day before, and there is a fishing pole in my hand. To begin with, I am not a fisherman. In high school, I spent most Saturday mornings yelling animal-rights chants in front of a local fur store. Now, less ideological, I just find the sport boring—or, at least, I did until this winter. I guess it all started with a thought: I want to eat more locally. And another thought: I love eating fresh trout more than almost anything else. Then, there was a moment of realization. My partner and I went cross-country skiing in the mountains last year and came to a lake where we found a whole family set up in the wide, flat middle with fishing poles. We skied out to say hello and discovered their impressive haul of fish. Seems easy enough, we said to ourselves, and made fishing plans for the coming year. Almost a year later to the day, we returned to that mountain lake, this time prepared with fishing licenses, poles, mealworm bait, stools, snacks, maybe a beer or two and a hand-powered auger. 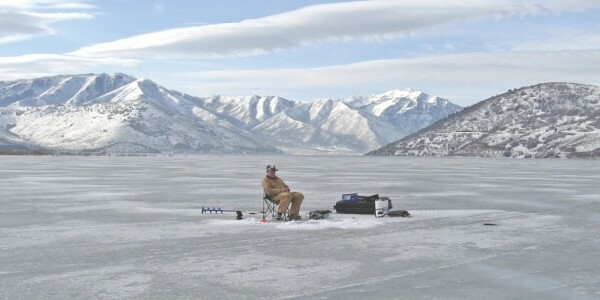 The sun—out in full force between snowstorms—felt overly warm for a day of ice fishing. Cautiously, I tested the lake’s surface. It felt slushy. Probing below the fresh, sun-melted snow, I struck ice. Still with some trepidation, I ventured out farther, toward the middle. Minutes later, I relaxed in front of my first hole, a baited line sunk into the icy water. My gloves, hat and extra coat rested on the snow while I bathed in the warmth of the day. This wasn’t what I had imagined. It certainly wasn’t any Garrison-Keillor-Norwegian-bachelor’s-frigid-northern-lakes-ice-fishing trip. Within two hours, we had our catch limit, eight fish between the two of us. We made plans to come back. That night, another storm blew in. Skiing out onto the lake the next morning, our holes were nowhere to be found, covered over with ice and a layer of fresh snow. The lake surface felt like concrete. The wind stung my face. Removing my gloves for a moment to hook my worm, I felt my fingertips numbing. I dropped my line into the auger hole and put my back to the wind. It was too cold to sit down, but it was still beautiful out. The mountains hugged around the lake. The silence was pure. I stood motionless reeling the line in slowly, very slowly. I bounced it, pulling the tip up and down. I reeled more and waited. Ten minutes passed without a single bite. In the winter, fish are cold and slow. They congregate in places under the ice. They sit and wait; they will not move to your bait. I had a bad hole with no fish. It was time to auger another. Ten paces away, I started again and, within three minutes, felt the lightest tug on my line. Adrenaline heated my body. I gave a quick jerk to hook the fish and started to reel. Putting up a final fight in the soup of crushed ice and water at the surface, my lake trout finally flopped out onto snow. I removed my gloves and grabbed his slimy, fighting body, threaded the stringer through his gills and threw him back into the water. My hands throbbed. With stiff and uncoordinated fingers, I pulled my gloves back on. We called it quits not much later, with a pitiful catch of only three fish. We packed up the auger, poles and unopened beers propped up in the snow. We didn’t dare gut our catch onsite and expose our hands again. We wrapped them whole in plastic bags and stuffed them in our packs. Skiing down the mountain, we dreamed of a pan-fried fish dinner, and schemed about our next ice-fishing trip.